Since the first dinosaur fossil was found by Mr.Sudham Yaemniyom, exgeologist of DMR, dinosaur fossil exploration at Phu Wiang has seriously commenced. In B.E. 2524 (1981) Mr.Choengchai Krikong, a DMR geologist, led a Thai-French fossil exploration group to investigate other dinosaur fossils in the vicinity of the peak of Pratoo Teema mountain, Amphoe Phu Wiang, Changwat Khonkaen. The group identified the fossils as huge herbivorous dinosaur bones, alligator teeth, tortoise shells and teeth and scale of ancient fish. 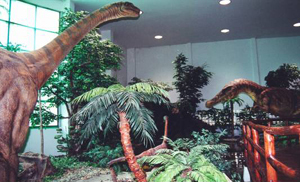 This bring to consequence discoveries of various kinds of dinosaur bones. 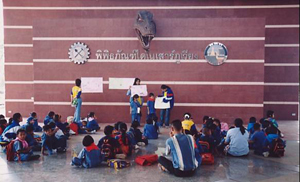 The museum was established by the cooperation of DMR, Tourism authority of Thailand and Changwat Khonkaen in order to be a tourist place of Changwat Khonkaen and a source of study and research for public especially youth. 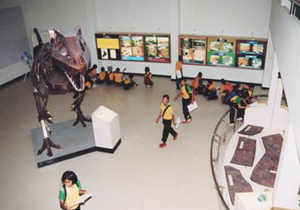 The museum is located in the area of Phu Wiang national park just 87 kms west of Changwat Khonkaen. From Khonkaen select a road to Chumpae and turn left to Amphoe Phu Wiang on highway no.2038. The entrance is just a little bit further from Amphoe Nong Rua. Or you can begin to travel from Amphoe Chumpae to Khonkaen turn left to join highway no.2038 until passing Auphoe Phu Wiang and select the road to Phu Wiang national park and the museum is just 3 kms before the park.